Those of us raising a family member with an intellectual and developmental disability are constantly bombarded with system changes, new terminology and ever-changing circumstances. When I find something unique and fun, I charge ahead and see if I can talk my daughter into giving the new tool a try. Since Leah is a teenager, I never know if she will have an interest. Luckily, a fun tool she has tried is the star form on the Informing Families website. The star form has helped us look at the different ways Leah can get support to reach goals of all kinds—from emergency preparedness to dream vacations, and everything in between. We also use it as a way to share information about Leah with important people in her life. Leah loves anything paper, as well as pens and markers, so the colorful star form was a hit on the first try. She lines up her colorful sharpies and begins filling in the blue section, Personal Strengths and Assets. 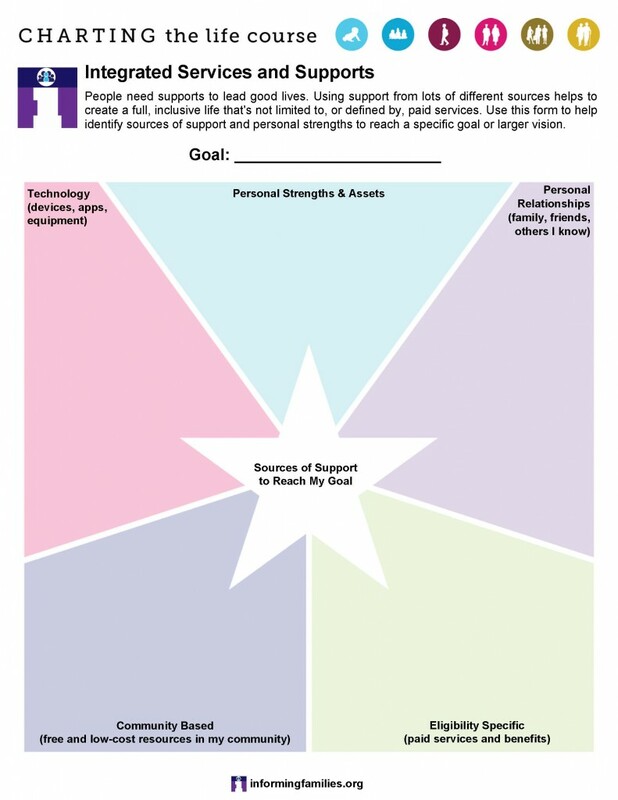 Since she has done many power point presentations for her IEP meetings, thinking about what she is good at has become a natural starting point whenever we use the star form. When Leah wants help with spellings or ideas, we brainstorm by writing a list on a white board and seeing which ones she wanted to include on her star form. Technology has been another easy section to fill in. Leah uses her smart phone for fun, texting, and surfing for new ideas to explore. The technology section has become an important topic because it gives us a chance to find opportunities for Leah to use her skills. Recently, a para educator showed her a transit app, and now Leah has turned into the family bus scheduler. We finish off the top section of the star form with Relationships. Although she is happy to have mom and her friends listed, I encourage Leah to think of others who are important in her life. Who might she like to get to know better? Are there neighbors she likes? How about friends at her transition program? We then usually move to the Eligibility Specific section, which she has no interest in at all. This is OK, but having her write down a few services helps me to think of ways she can get support for some of her activities. We end on the Community-Based section as we always have lots of ideas on places to go. This is a great time to think of events at libraries, music and many other free community events. We’ve attended presentations on owls, learned to make felt, and attended a journal class, all for free at local libraries. When my daughter was younger, families used to say if she got services on a waiver that was the “golden ticket.” As Leah has aged, I’ve realized services are helpful, but they are only part of her life. To have a full and great life, Leah needs to develop connections and support beyond services. People often say, “Think outside the box,” and now we are being asked to think inside the star. We did and it was fun. Give it a try!